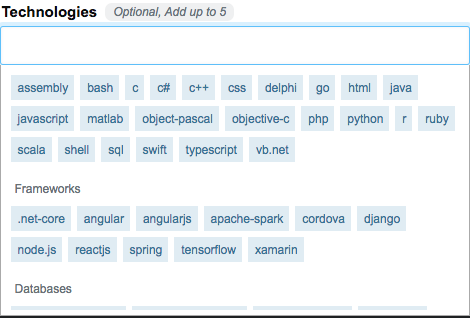 I was going through the Calculate your salary and found that under the technologies section, Ruby on Rails is no more an option (as a framework). Which either means the popularity of Ruby on Rails is not enough to be listed there or Ruby on Rails is not an important factor when it comes to salary. Not only that, one can not even type Ruby on Rails and select it, probably because it's not one of the acceptable item. I remember a similar incident happening while filling in the SO's developer survey form and I was surprised to see that the less popular frameworks were populating as an option but Ruby on Rails. I am sure people building these forms must have strong reasons behind it, but it would be helpful to understand their point of view. Why are the off-topic flags buried under “It should be closed for another reason…”? Can I add more than one Google account under My Logins? For some questions edit option disabled on mobile website, Why? Why do remote jobs cost more than office jobs? Why is there only the “moderator intervention” option when flagging an answer? Option to put same content under different sections in documentation?